Keeping track of payroll tax reporting and payments requires careful attention to detail. Setting up a yearly payroll tax calendar can help you avoid fines and penalties and keep you on track. Even if you have a CPA or bookkeeping service do your payroll taxes, you need to know when these taxes and reports are due. Federal income taxes and FICA taxes are sometimes called "941 taxes," because they are included in IRS Form 941, the quarterly wage and tax report. State income taxes are also withheld from employee pay and reported to your state, if your state has income taxes. If you pay non-employees, you are not required to withhold income taxes or FICA taxes from the payments you make to them. You are required to complete an annual report for contractors and file that report with the IRS. Before you begin using this calendar, you will need to determine which payroll tax deposit schedule applies to your business for 941 taxes. The deposit schedule you must use depends on the size of your payroll. If you have a large payroll, you must make payroll tax deposits semi-weekly (twice a week). Tax payments due on the last day of the month or the 15th of the month. 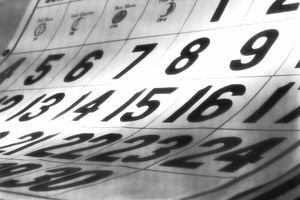 If that date is a weekend or holiday, the due date is the next business day. So, if the end of the month falls on a Saturday, the due date is the following Monday. Read more about the semi-weekly deposit rule to see if you must make these payments. Payroll tax deposits must be made by the 15th of each month for the previous month unless the semi-weekly rule applies (see above). Quarterly payroll tax reports on Form 941 are due at the end of the month after the end of each quarter. If you have made all payroll tax deposits on time and in full, you have until the 10th of the following month to submit Form 941. Federal unemployment tax deposits are due at the end of the month following each quarter if your business' tax liability exceeds $500. Annual Wage and Tax Statements to employees (on Form W-2) and contract workers (on Form 1099-MISC) are due at the end of January for the previous year. Federal unemployment tax report on Form 940 and tax deposit is due by the end of January for the previous year. If all tax deposits have been made in full and on time, the deadline is the 10th of the next month. Transmittals to Social Security on Form W-3 (along with all W-2's) and on Form 1096 (along with all 1099's) are due by the end of January, for the previous year. Payroll tax deposits must be made using the Electronic Federal Tax Payment System (EFTPS); deposit coupons (Form 8109) are no longer accepted by the IRS. You can use the tax calendar on this site as a starting point for your calendar. The tax payment and report schedule below is for federal payroll taxes. Consult your state's taxing authority (department of revenue or other) for state and local payroll tax requirements. The due dates for semi-weekly payments for 941 taxes are not included in this schedule. Due dates for federal payroll taxes are as stated below except that deposits or reports are not due on a weekend or holiday. In any year when a due date falls on a weekend or holiday, the report or deposit is due on the next following business day. So, if a report is due January 15, and that is a Saturday, the report is due January 17. January 30: Deposit Federal Unemployment Tax (FUTA) owed through December if $500 or more. January 31: Provide employees with prior year wage and tax reports (form W-2 for employees. January 31: Submit year-end employee transmittal forms (Form W-3) to Social Security Administration, along with all W-2s. April 30: Deposit Federal Unemployment Tax (FUTA) owed through March, if $500 or more. July 31: Deposit Federal Unemployment Tax (FUTA) owed through June if $500 or more. October 31: Deposit Federal Unemployment Tax (FUTA) owed through September if $500 or more. You may also want to review this month-by-month business tax calendar. which includes business income tax payment due dates.